Have questions about this product (ID: 2567)? Are you ready to have the luxury you always dreamed of ? 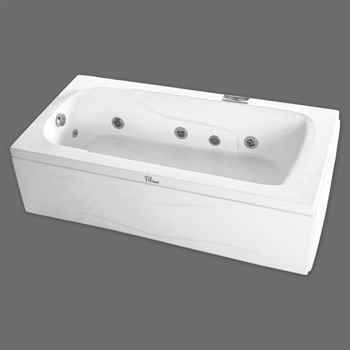 Then ,unwind in a bath designed to relieve stres and enhance well-being. With individually adjustable hydromassage jets and a supremely supportive design, this whirlpool bath is the ideal way to relax. The oval shape fits nicely into smaller rooms, yet the curved sides carve out a spacious cocoon for soaking. It’s dimension is W 59” x D 32” x H 17”. Are you ready to have the luxury you always dreamed of ? Then ,unwind in a bath designed to relieve stres and enhance well-being. With individually adjustable hydromassage jets and a supremely supportive design, this whirlpool bath is the ideal way to relax. The oval shape fits nicely into smaller rooms, yet the curved sides carve out a spacious cocoon for soaking. When you come to your home after a long day and you just want to relax, don’t wait a minute to have this perfect hydro massage system! It is classic rectangle-shaped design. We will drop in your house just to install with faucet-mount deck. It’s innovative technology enables this pump to provide a strong, steady level of hydro massage. Hyro massage system has got 8 individually adjustable multi-directional hyro-massage jets. It’s material is acrylic. Bath therapy type is air/whirlpool. This product has got two year limited warranty. No drain assembly included of this product.There is overflow drain in it. It has got one seating capacity. Drain placement is on front. It’s dimension is W 59” x D 32” x H 17”.